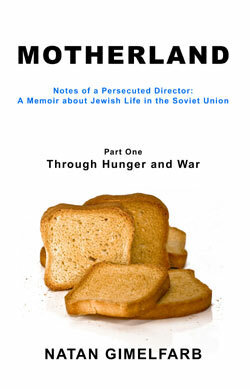 An English translation of Notes of a Persecuted Director by Natan Gimelfarb (originally written in Russian). Only Part I is available in English at this time. Motherland offers a unique, inside look into Jewish life in Communist Russia. It wasn't written to make a point or to get sales or recognition; it wasn't intended to be available to the general audience or even to be translated into English. Its goal was to leave an honest portrayal of a man's life to his progeny, but the result offered too much insight to be left on dusty family bookshelves. Motherland implies as much as it says, as it takes you through communism, anti-Semitism, the Great Famine, the Great Purge, World War II, and the everyday realities of Russian life. A touching story of growth, loss, betrayal, and difficult choices, Motherland offers heartache and human insight worthy of fiction, while making you feel the human cost of grandiose events and ideas. But it isn't a story about making excuses or accepting your fate. Motherland shows how much a person can achieve with moral strength, faith, and determination, despite the tremendous destructive power of uncontrollable circumstances. Natan displays exemplary human decency despite losing parents at an early age and living through the toughest of times. He performs in school despite missing years of classes. He succeeds in relationships and love despite disfiguring wounds. He rises to national prominence in his career despite the severe handicap of his ethnicity. And when the all-powerful Party comes after him, with all the jealousy and hate that such success brings, he succeeds in publicly defending himself in procedures where few people, much less Jews, have been successful. Part I covers Natan�s life through hunger and war until graduation from the university. Part II covers his career and fight with Soviet authorities. Copyright � 1999-2019 Natan Gimelfarb, Ilia Gimelfarb. All rights reserved.